I’m curious to see what the results are. If you haven’t already, take EG’s survey! There is an odd sidebar to this request. 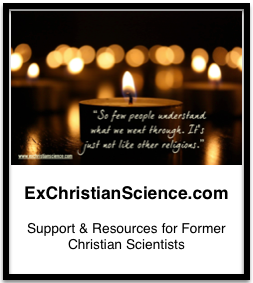 I happen to know from experiences that there are numerous Christian Scientists who have left the organized Church, but are still into Christian Science. I have a theory that there are enough of them to fill the churches sort to speak. Of course, they aren’t atheists or just mad at some event in their lives. They are independents for a whole variety of reasons. Each is doing his or her own thing. They are not attending church or having contacts with the churchy Christian Scientists. I have met several formerly listed practitioners in the neighborhood and elsewhere who no one in the standard Christian Science Community knew about their existence. I’ll pass your comment along to EG, I’m sure he’ll be interested to know and perhaps he’ll conduct another survey! Thanks for posting this! I’m hoping to get at least 100 responses, so I’m holding out for that. I’m about 1/4 of the way there. I just noticed the comment above, and I agree there probably are a number of folks out there who have left the “organized” Christian Science church (I know of at least 1 maybe 2 who live in my area), but as for there being enough to re-fill the giant mausoleums that pass as CS churches, I’d want to see more than anecdotal theorizing. How one could construct a survey to count these folks, well, I could just have the “still with CS, not in the church” option on my religious affiliation question. However, I’ve more narrowly directed this survey towards those who’ve completely left CS. I would be very interested in how many “independent” folks there are out there. I’m sure there are a few. Tens or hundreds of thousands, I’m skeptical on that. Historically, there haven’t even been a million CSists, so playing the numbers, I don’t think there are very many, just as there are likely not very many ex-CSers like myself out there–few enough, that I will be thrilled if I get 100 responses on my survey.